I have wondered what it is that leaves the small bones of rodents amongst the limestone beneath the Little Asby Hawthorn. Yesterday, under the cloud-scudded blue of a warm summer sky, I was given a clue. As we strode across the limestone pavement a wily fox shot out from hiding just metres from us and raced sure-footed across the stones, fluid as water, a russet blur with a white-tipped tail. The wallk to the Little Asby Hawthorn, which we led for two separate groups, as ever held surprises to add to what is already a landscape that compels regular pauses. 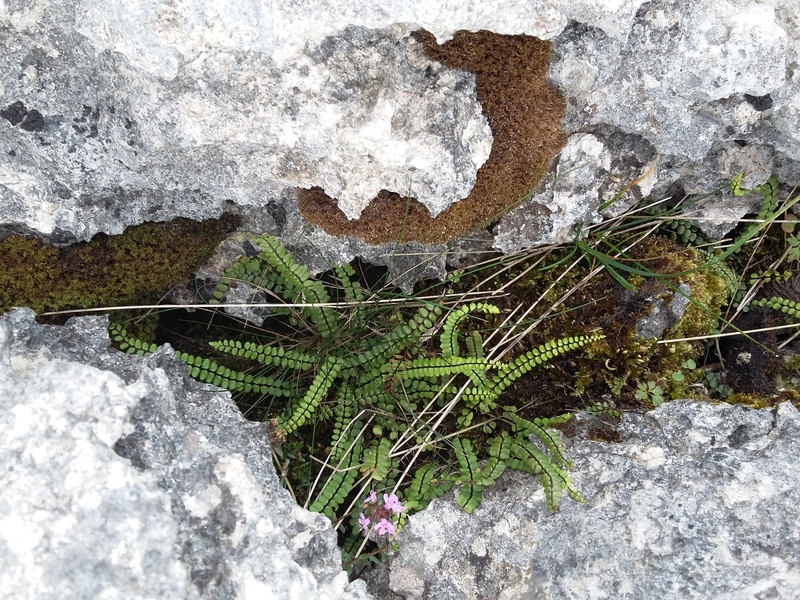 The views were dominated by the wide, open sky above us, while at our feet there were flowers in uncut meadows and the wonders hidden in time-worn limestone pavements. We walked and paused and talked, and shared what we know about the area, as well as poetry that has been written here, and conversations ebbed and flowed. 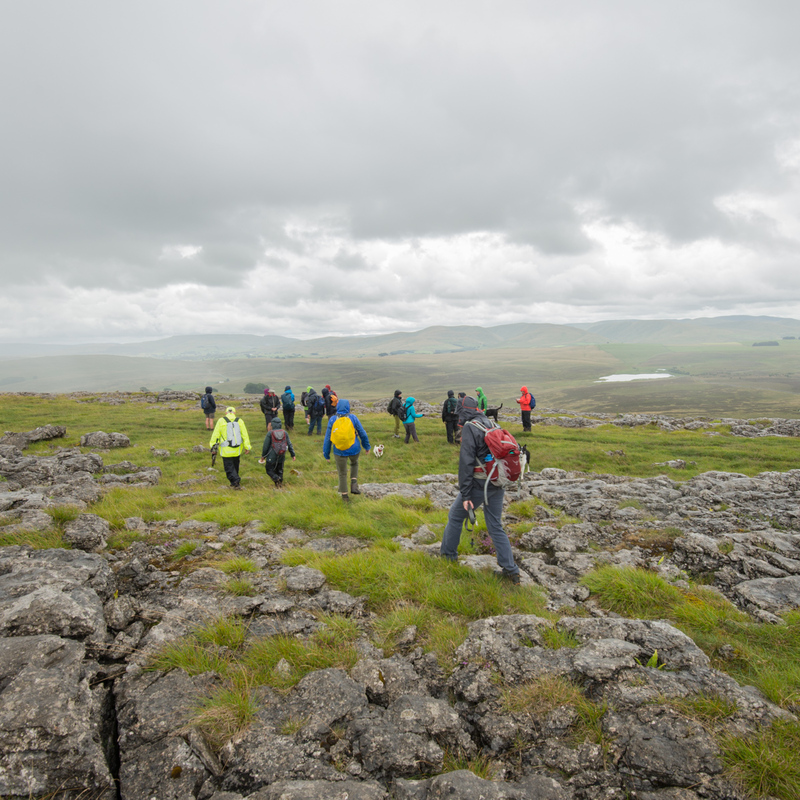 The second walk was on the 1st of August, which marked the extension of the Yorkshire Dales National Park. It was fitting to walk to this tree in celebration. 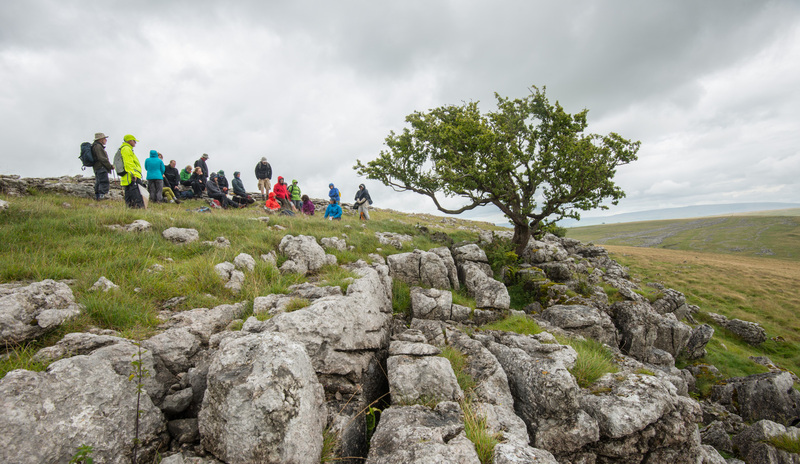 The landscape really is special, encompassing rare limestone pavement formed some 350 million years ago with specific ecology to match, traces of pre historic human habitation, and field systems and farming practices today based on the traditional system of commoning. And the views are exceptional. We walked to the hawthorn from Great Asby with Jan and Sophie from Friends of the Lake District, an organisation that was campaigned tirelessly for this extension and was instrumental in the establishment of the Lake District National Park. We were joined by several others and together we followed in the footsteps of a group walk we did last week. Our route took us from the village of Great Asby, with some of its houses dating from the sixteenth century out to the wide open fields beyond Cockeld Farm. Last week we were beset with light but persistent drizzle. This week, the sun stayed out and we didn’t need to reach for our coats. Grassland soon gives way to limestone, as if the hill is bearing itself and its history, revealing its fossilised story in pitted limestone shaped over thousands of years into clints (blocks or the surface of the pavement) and grikes (fissures) We dallied here, spying hart’s tongue ferns, herb Robert, wood sorrel, dogs mercury and other plants that are all indicators of woodland – reminders that trees once stood on this exposed and rocky land. Now the trees we spot can be counted on one hand, with the Little Asby Hawthorn the most striking. Others don’t make it beyond shrub height, instead hunkering down in between the stone slabs and keeping their foliage below the nibble-reach of sheep. While we watched the fox running off with a swagger, some others in the group had their eyes down, transfixed by a frog. Though the scene here at first appears to be barren the closer you look, the more you find. And without rain and wind we were able to sit and take it all in and listen to Jan Darall from Friends of the Lake District talking about the history of the common and some of the features that date back long before commons were established. Funerary cairns, sheilings, bields and lime kilns dot this open landscape. Along the way we also took breaks to talk about trees and The Long View, and I read some poems. They seem to gain extra depth when read in the locations that inspired them. As for the fox, we may never see her again. 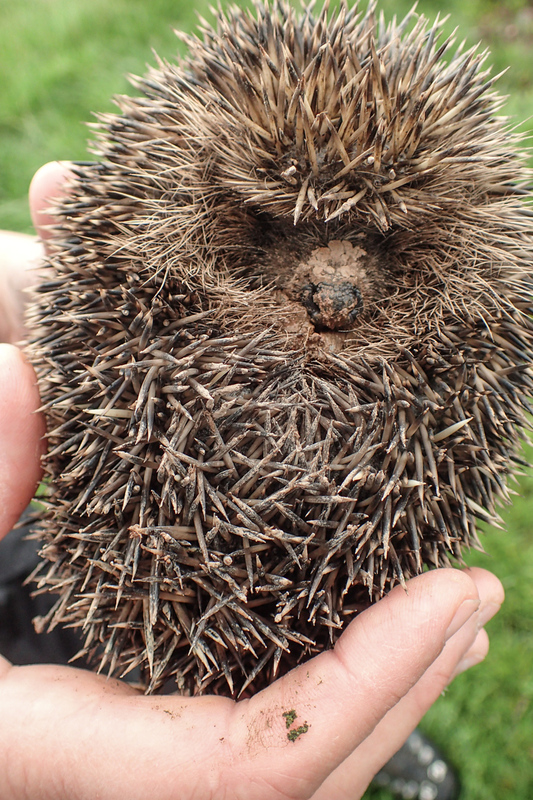 Last week, another animal unexpectedly introduced itself to our group – we found a hedgehog stuck in the mud below a cattle grid, with no way out. Brave hands reached in a rescued the spiky animal, and there is now a ramp in place in case another hedgehog heads down that way. For more information on the ecology of Little Asby, take a look at this blog. And if you’d like to read about the archeology of the area, Friends of the Lake District have put together a Little Asby History and there is lots to read on the Asby Parish website, thanks to John Smith. Finally, we’d like to thank the ladies that served up tea and freshly made cakes and scones in the church after both our walks. Delicious and very welcome!